My friends and I stumbled upon Piroshky Bakery in the Pike Place Market while we were attending an AWP conference in Seattle. I wasn’t actually hungry when we found the bakery and, to be honest, I almost passed up on buying anything. But then I saw their Cheddar Cheese and Garlic Rolls–fluffy, cheesy puffs of wonder–and knew I would regret it if I didn’t buy one. I ate half of the roll as we walked around the market place searching for Turkish tea (we never found any, but we did find an amazing tea shop) and yarn (we found plenty) and figured I would save the other half for later. But on the walk back to our hotel, we happened upon a homeless man who wanted spare change to buy a meal. I didn’t have any change, but I did have half of a delicious cheddar roll. The roll and I parted, only ever half-knowing one another. Two weeks later, and I was still thinking about the deliciousness that is Prioshky Bakery’s Cheddar Cheese and Garlic Roll. 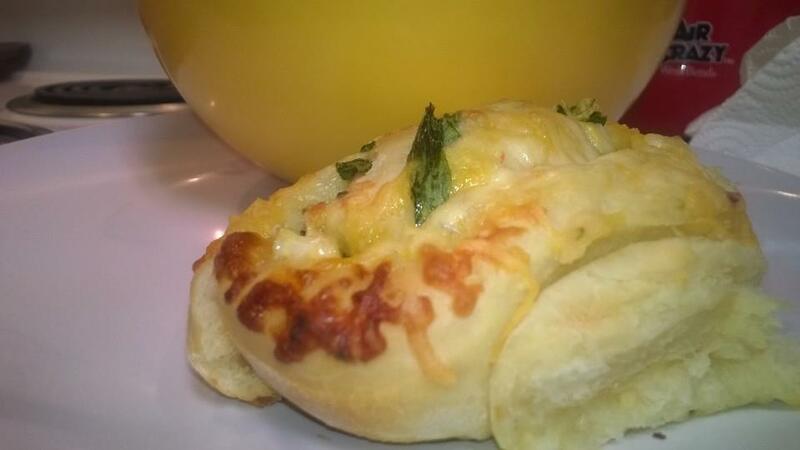 Armed with a bread machine and time, I added a few ingredients to a favorite dinner roll recipe and came up with a satisfying Cheddar Cheese and Garlic Roll creation. Place water, butter, egg, bread flour, sugar, salt, and yeast in bread machine in the order recommended by the machine’s manufacturer. Press dough/manual cycle. Remove dough from bread machine and place on a lightly floured baking sheet. Cover and let rise for an additional 10 minutes. Roll dough out onto a lightly floured surface. 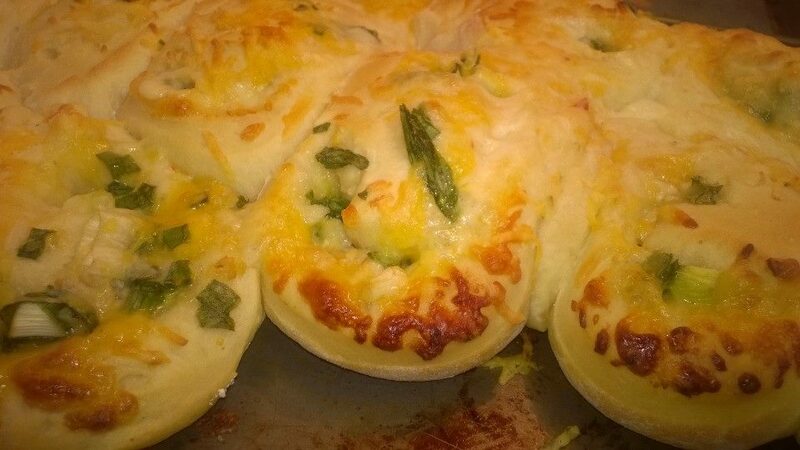 Sprinkle green onions, minced garlic, garlic powder, and cheeses onto dough. Place dough on a lightly greased baking sheet, making sure to space the dough rolls 2 inches apart.